Stem Cell Line Cytogenetics :: Applied Genetics Laboratories, Inc. Stem cell lines have held increasing promise as realistic treatment for some medical conditions (Cueller-Rodriguez et al., 2011; Shah, 2011; Hotkar and Balinsky, 2012; Thompson et al., 2012), and they have proved useful to our understanding of the fundamentals of developmental biology and gene expression (Loh et al., 2011). One of the confounding characteristics of stem cells is chromosomal instability associated with growth in culture. These chromosomal instabilities include whole chromosome gains and losses as well as amplifications and deletions of sub-chromosomal regions, and they have been found in both human Embryonic Stem Cells (hESC) and human induced Pluripotent Stem Cells (hiPSC). 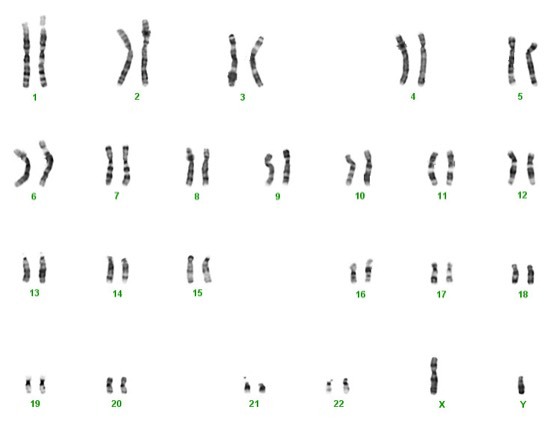 These abnormalities have been discovered in a variety of laboratories using a wide range of techniques including conventional G-banding, high-resolution comparative genomics (CGH), spectral karyotyping (SKY), fluorescence in situ hybridization (FISH), mFISH, PCR, and high-resolution single nucleotide polymorphisms (SNP) and copy number variation (CNV) (Hanson and Caisander, 2005; Baker et al., 2007; Catalina et al., 2008; Närvä et al., 2010; Laurent, 2011; Peterson et al., 2011; Varela et al., 2012; Martins-Taylor and Hu, 2012). The long term implications of chromosomal instability on the promise of stem cells in regenerative medicine are not fully understood. Several investigators have noted a similarity between the growth advantage to cells with specific chromosome abnormalities that give rise to tumors in vivo, and the possibility of chromosomal aberrations providing a growth advantage to stem cells in culture. These authors advise frequent monitoring of stem cells for genomic stability during culture to mitigate the long term risks (Hanson and Caisander, 2005; Laurent, 2011). Applied Genetics Laboratories can determine whether your stem cell lines have a normal karyotype, and help you interpret and understand the implications of an abnormal result. AGL has developed technologies for growth and harvest of stem cell lines that are appropriate for preparation of metaphase spreads from stem cell lines. We have broad experience establishing the karyotype of G-banded human chromosomes as well as karyotyping a large variety of experimental animals including mice, rats, cats, pigs, and cows. Our Chief Science Officer is an ABMG Board Certified Clinical Cytogenetics lab director and our Technical Director is ASCP certified in Clinical Cytogenetics (see About Us). We can apply our expertise in chromosome banding and identification to your stem cell lines, whether your project is in the exploratory, mid-research, or late phase of therapeutic product development, or whether you use stem cells as a research test system for studies such as toxicology, developmental biology, or gene expression. Given the evidence in the scientific literature for stem cell chromosomal instability, we recommend monitoring the chromosome stability of your stem cell lines throughout your research project. We are offering high resolution G-banding as a relatively efficient means to obtain a genome-wide understanding of your cell’s genetic status. We understand your cells have therapeutic potential in regenerative medicine; therefore we provide karyotypes for your cells with the same care as clinical service labs provide karyotypes for patients. To learn more about using AGL’s stem cell cytogenetic services, contact us to discuss your specific requirements and logistics of cell transport. 1) The service described above is provided using AGL’s Quality Assurance Program for Research (QAPR), consisting of standardized policies and procedures governing personnel, facility, and equipment requirements, as well as record retention; and includes SOPs for specimen receipt, handling, testing, data analysis, reporting and quality assessment. The Quality Assurance Program for Research (QAPR) is intended to consistently provide high quality testing and reporting to clients needing stem cell cytogenetic characterization during the exploratory, early research, or early phases of product development, and to clients who do not intend to submit the results to the FDA. 2) If you intend to submit your stem cell project data to the FDA as part of an application for a therapeutic product, biologic, device, or other FDA application, we can provide this service in compliance with the mandated Food and Drug Administration's Good Laboratory Practice regulations (21 CFR Part 58) for these types of applications. There is an extra charge for GLP Quality Assurance. See our Cell Line Characterization Services page for a description of this service, or contact us to discuss your quality assurance and technical needs. Sign up below if you would like to receive email messages regarding new products and services as well as important updates on our current products and services as they become available. Baker DE, Harrison NJ, Maltby E, Smith K, Moore HD, Shaw PJ, Heath PR, Holden H, Andrews PW. Adaptation to culture of human embryonic stem cells and oncogenesis in vivo. Nature Biotechnology. 2007 Feb; 25(2): 207-15. Catalina P, Montes R, Ligero G, Sanchez L, de la Cueva T, Bueno C, Leone PE, Menendez P. Human ESCs predisposition to karyotypic instability: Is a matter of culture adaptation or differential vulnerability among hESC lines due to inherent properties? Molecular Cancer. 2008 Oct 3; 7:76. Cuellar-Rodriguez J, Gea-Banacloche J, Freeman AF, Hsu AP, Zerbe CS, Calvo KR, Wilder J, Kurlander R, Olivier KN, Holland SM, Hickstein DD. Successful allogeneic hematopoietic stem cell transplantation for GATA2 deficiency. Blood. 2011 Sep 29; 118(13): 3715-20. Hanson C, Caisander G. Human embryonic stem cells and chromosome stability. APMIS. 2005 Nov-Dec; 113(11-12): 751-5. Review. Hotkar AJ, Balinsky W. Stem cells in the treatment of cardiovascular disease--an overview. Stem Cell Rev. 2012 Jun;8(2):494-502. Review. Laurent LC, Ulitsky I, Slavin I, Tran H, Schork A, Morey R, Lynch C, Harness JV, Lee S, Barrero MJ, Ku S, Martynova M, Semechkin R, Galat V, Gottesfeld J, Izpisua Belmonte JC, Murry C, Keirstead HS, Park HS, Schmidt U, Laslett AL, Muller FJ, Nievergelt CM, Shamir R, Loring JF. Dynamic changes in the copy number of pluripotency and cell proliferation genes in human ESCs and iPSCs during reprogramming and time in culture. Cell Stem Cell. 2011 Jan 7; 8(1): 106-18. Loh YH, Yang L, Yang JC, Li H, Collins JJ, Daley GQ. Genomic approaches to deconstruct pluripotency. Annual Review of Genomics and Human Genetics. 2011 Sep 22; 12: 165-85. Martins-Taylor K, Xu RH. Concise review: Genomic stability of human induced pluripotent stem cells. Stem Cells. 2012 Jan; 30(1): 22-7. Närvä E, Autio R, Rahkonen N, Kong L, Harrison N, Kitsberg D, Borghese L, Itskovitz-Eldor J, Rasool O, Dvorak P, Hovatta O, Otonkoski T, Tuuri T, Cui W, Brüstle O, Baker D, Maltby E, Moore HD, Benvenisty N, Andrews PW, Yli-Harja O, Lahesmaa R. High-resolution DNA analysis of human embryonic stem cell lines reveals culture-induced copy number changes and loss of heterozygosity. Nature Biotechnology. 2010 Apr; 28(4): 371-7. Peterson SE, Westra JW, Rehen SK, Young H, Bushman DM, Paczkowski CM, Yung YC, Lynch CL, Tran HT, Nickey KS, Wang YC, Laurent LC, Loring JF, Carpenter MK, Chun J. Normal human pluripotent stem cell lines exhibit pervasive mosaic aneuploidy. PLoS One. 2011; 6(8): e23018. Shah K. Mesenchymal stem cells engineered for cancer therapy. Advanced Drug Delivery Reviews. 2012 Jun 1; 64(8): 739-48. Review. Thompson LM, Ceja ME, Yang SP. Stem cell transplantation for treatment of sickle cell disease: bone marrow versus cord blood transplants. American Journal of Health-System Pharmacy. 2012 Aug 1; 69(15): 1295-302. Varela C, Denis JA, Polentes J, Feyeux M, Aubert S, Champon B, Piétu G, Peschanski M, Lefort N. Recurrent genomic instability of chromosome 1q in neural derivatives of human embryonic stem cells. Journal of Clinical Investigation. 2012 Feb 1; 122(2): 569-74.